Syllabus of the Online Course (Subject): New Asian-African Strategic Partnership (NAASP). 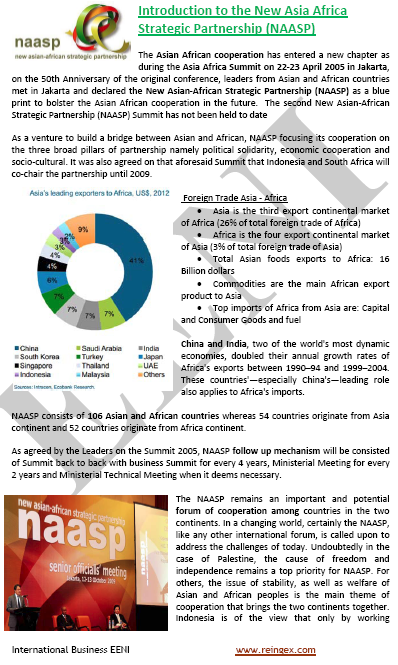 In the Asia-Africa Summit held in Indonesia (Jakarta, 2005), the African and Asian leaders adopted the New Asian-African Strategic Partnership (NAASP) with the main objective of encouraging bi-continental cooperation between them. South Africa and Indonesia co-chairs the New Asian-African Strategic Partnership. The New Asian-African Strategic Partnership is a forum for cooperation between fifty-four Asian Countries and fifty-two African Countries. The New Asian-African Strategic Partnership devotes particular attention to liberation of Palestine. The Asia-Africa Strategic Partnership belongs to African Civilisation, Buddhist Civilisation, Hindu Civilisation, Islamic Civilisation.